Time Magazine recently published an article "Fifty must-have iPad apps". I know that I usually write about books and apps to share with children, but today I'd like to share apps that I am finding myself using to conduct my professional life. I am actually finding that tweens and teens are starting to use these apps as well. Check out the link to the article for the full list. Here I am going to share 5 apps I've been using regularly that are on their list, and 5 apps I plan on checking out soon. 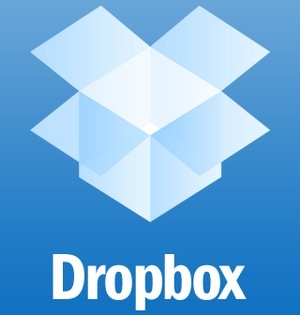 Dropbox: I use this constantly to access documents on the go, to backup and store files, and to share documents with others. Great, smooth interface. Feedly: I have switched all my blog reading over to Feedly and am loving the iPad app. In fact, I'm reading more blogs than ever now with Feedly. Love it! Flipboard: I used Flipboard more before I started using Feedly, but I still switch over to it for accessing Twitter and other news in a visual way. I'm intrigued by SLJ's Digital Shift article on using Flipboard for students to create their own customized, curated digital magazines. Paper: This app lets me doodle, draw and brainstorm in such a creative, intuitive, beautiful way! I just love it. Travis Jonker of 100 Scope Notes first turned me onto Paper, and then it was recognized by Apple as the App of the Year. Waze: This traffic app helped us navigate our way through LA traffic maze last summer - with my 13 year old navigating and me at the wheel! Waze identifies optimal routes, taking into account traffic, hazards, and blockages as well as simple navigation. 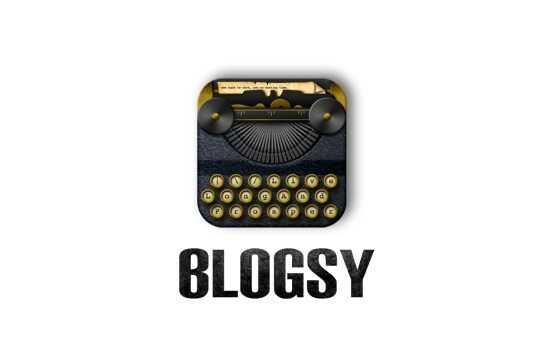 Blogsy: I have not written blog posts on my iPad yet. I'm wondering if any blogging friends have done this much. Every time I try, I find it clunky and difficult. Hoping that Blogsy has a better interface! Comics: Love my first look at this interface. I'm curious to see if this app has many comics for kids. Newsy: I'm interested in Newsy's video approach, and want to see if it's sensationalized or straightforward. Time writes that it "features professional anchors who deliver the news in easy-to-digest, no-fluff snippets," which sounds good to me. Pinnacle Studio: I'm interested in moving toward video editing on the iPad. I love taking videos of student performances using the iPad, and am curious whether this app can give me similar control and options as a desktop video editing tool like iMovie. Tweetbot: I use Twitter throughout my day for professional connections, resources and learning opportunities. I'm curious to see if Tweetbot provides a more streamlined, reliable app than the Twitter app. What apps do you consider essential for your professional and personal learning? Do you see kids starting to use these? Are there any you'd add to Time's list? I've loved being part of the American Association of School Librarian's task force choosing the Best Apps for Teaching and Learning. I can't wait to share our recommended list this June at the ALA Annual Conference! Today is St. George’s Day, the patron saint of England, and it’s the day we traditionally celebrate Shakespeare’s birthday (see a timeline at Mr. William Shakespeare). 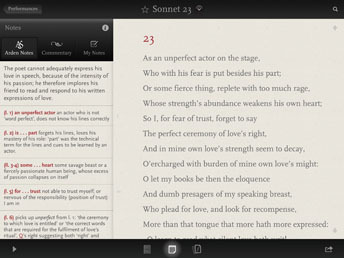 I've been looking forward to reading Touch Press's fantastic app The Sonnets by William Shakespeare, and I snapped it up today when I saw it on sale. I want to share this wonderful enhanced, multimedia experience that provides both artistic enjoyment of classic literature and increased academic understanding of complex text. Touch Press writes that "The Sonnets by William Shakespeare allows you to enjoy, explore and understand these immortal works of literature as never before." While that seems like hyperbole (as never before? ), I am truly amazed at the rich experience that reading this app brings. 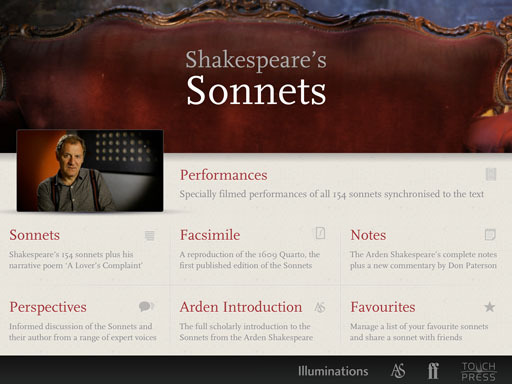 This app brings together dramatic performances of Shakespeare's 154 sonnets with the annotated, unabridged text and critical essays. Students can watch professional actors ranging from Patrick Stewart to Kim Cattrall recite the sonnets - an inspiring experience on its own. But you can also switch over to reading the poems while you listen to the professional reading, with lines highlighted as you go. Just watch David Tennant's performance of the famous Sonnet 18: "Shall I compare thee to a summer's day?" The actors' readings bring me so much greater appreciation for these poems than simply reading the text by itself. I also love the way that Touch Press brought so many different actors to this project, providing readers with the sense that we all can connect with Shakespeare's works in different ways. The academic notes and videos also provide many different ways in for readers, reinforcing the idea that there is no one correct interpretation of these poems. Since I was reading more for my own pleasure, I was drawn to the video interviews with different academics and professionals. It was fascinating to hear different opinions on the same topic, giving me insight into the range of debates that still surround these poems. For example, I never realized that we don't exactly know whom the Sonnets are written for or to. Students will also find the line by line annotations helpful. Throughout, Touch Press marries the text and the narration, the artistic and the academic, the visual and the auditory -- providing a seamless, multi-layered, multi-media reading experience. Overall, this is an app that I will come back to again and again. 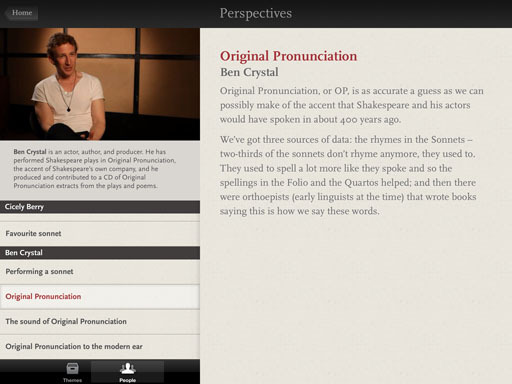 Get this for students who are auditory learners, but also get this for friends who love listening to poetry or learning about Shakespeare's plays. 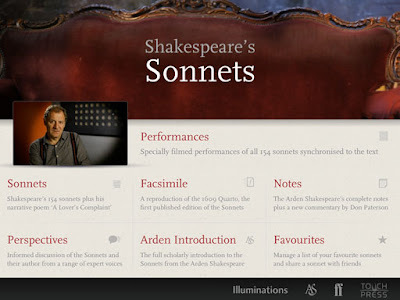 For more information, see the Touch Press website: The Sonnets by William Shakespeare. For more reviews, see: School Library Journal, The Guardian newspaper, and The Independent newspaper. I purchased the review copy for my own home library. If you make a purchase using the Amazon links on this site, a small portion goes to Great Kid Books (at no cost to you!). Thank you for your support. Children are eager to explore the world around them. Many love to read about animals, learning about different species, their habitats and life cycles. I've often wondered how we help young children learn about problems caused by pollution, habitat loss or global warming without making children too worried or sad. 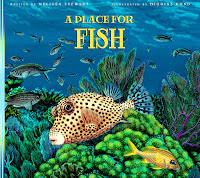 Melissa Stewart's A Place for... series of picture books look at environmental problems, but focus on ways people can change them and help animals live and grow. Turtles live in all sorts of different environments, but many have faced challenges brought about by environmental problems. 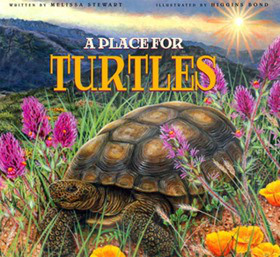 Melissa Stewart introduces young children to specific problems that turtles face, such as habitat loss caused by invasive nonnative plants, but does so in a clear, simple way. Throughout, she emphasizes that we can all help change these problems. "Some turtles have trouble building nests when new kinds of plants spread into their home habitat. When people find ways to control the new plants, turtles can live and grow." Stewart balances this clear, simple narrative with sidebars that provide more details on different species and the challenges they face. These specific examples add detail and interest, especially when combined with Bond's detailed acrylic illustrations. For example, Stewart writes that the bog turtle's wetland habitat has been threatened by invasive purple loosestrife that is growing too thickly. Families will find it interesting to talk about different projects that communities are undertaking to improve life for turtles. I have greatly enjoyed following Melissa Stewart's blog: Celebrate Science. - she shares her passion for science, animals and the environment in many different ways. She has been thinking deeply about how to connect information picture books to the Common Core, and has many helpful ideas for teachers and librarians. The review copy was kindly sent by the publishers, Peachtree Publishers. If you make a purchase using the Amazon links on this site, a small portion goes to Great Kid Books (at no cost to you!). Thank you for your support. Fantastic visit with Vaunda Micheaux Nelson at our school!! Last week, our students were thrilled to spend time with Vaunda Micheaux Nelson, learning about her writing process and hearing her passion for her work. As we read books by different authors, we try to think about an author's purpose in writing a story or a piece of nonfiction. We dig into the ideas authors layer in their work. Our students really appreciated hearing directly from Ms. Nelson about her many books. 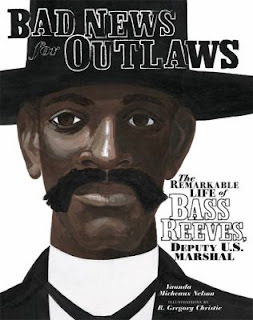 Ms. Nelson started by talking with our 4th and 5th graders about Bad News for Outlaws: The Remarkable Life of Bass Reeves, US Deputy Marshall. 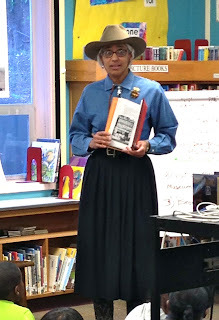 She told students that one day she was watching a documentary about Blacks in the Old West and that there was a brief mention of Bass Reeves. "I wondered why I didn't know about him, and felt that everyone should know about him." "Bass was honorable; he had integrity; he was strong, smart and clever." Ms. Nelson told our older students about her newest book, No Crystal Stair, which tells the story of her uncle's bookshop in Harlem. She talked about how he wanted to establish a bookshop that helped African Americans learn about their history, their stories, their literature. We are all looking forward to the picture book which Ms. Nelson is writing about her uncle's bookstore. Our 2nd and 3rd graders talked with Ms. Nelson about her picture book Almost to Freedom, a story about a young girl's escape to freedom through the Underground Railroad. She started off by talking about why she writes. "I know it's because my parents read to me every night. My siblings would argue about going to bed, but secretly I was dying to get into bed because my mom would read the next chapter of our book. My dad loved poetry and would recite poetry from memory to me." Her parents taught her not only to love stories, but to love words and to understand their power. 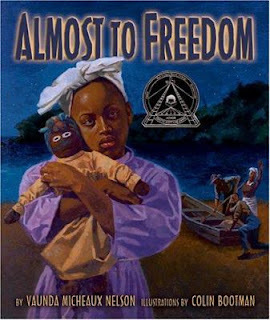 Our students love Almost to Freedom because it's told from the perspective of a doll. Ms. Nelson really creates the voice of this doll, and students can connect to that voice. "If those dolls could talk, what would they tell me?" I loved a 3rd grader's question: "When you write, do you start feeling how your characters are feeling?" Yes, she does very much -- because she needs to feel what it might be like to run away through the forest at night hiding from the slave catchers, to be able to share those feelings in her words and create them for her readers. She brought her collection of African American dolls to share with our children. Enjoy this Animoto slideshow of our visit with Vaunda Micheaux Nelson. I want to thank the Association of Children's Librarians of Northern California for sponsoring Vaunda Nelson's trip to the Bay Area. For a wonderful resource of materials about sharing history with children, check out ACL's resources from their recent Institute. I would also like to thank the Emerson PTA for sponsoring Ms. Nelson's visit to our school. Our children appreciate your support and enrichment. But most of all, I want to thank Ms. Nelson herself for her time, energy and enthusiasm sharing her passion for stories with our children. 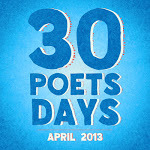 I look forward to each April, when libraries around the US celebrate National Poetry Month. I share poetry with students throughout the year, but it's so much fun to shed special light on poetry each spring. Today I'd like to share a few resources that I particularly love. Deep mine shaft down underground. Before the shaft fills and dreams drown. Another blog that I enjoy reading throughout the year is Poetry for Children, a blog written by Sylvia Vardell. Sylvia is a professor and author of the ALA bestseller Poetry Aloud Here, also Poetry People, Children’s Literature in Action and the nationally recognized blog, Poetry For Children, as well as co-editor of the first digital anthologies of poetry for young people, the PoetryTagTime series. This month Sylvia is featuring a "blast from the past," connecting favorite classic poems to contemporary poetry. Her blog is full of resources and ideas that are wonderful to follow up on. I love the way she reminds us to dig up the classics, ranging from AA Milne's When We Were Very Young to Langston Hughes' The Dream Keeper. Then she ties in all sorts of contemporary poetry collections that you'll want to find. Take the time to explore the interviews Sylvia has done with poets over the years. Last year she featured an interview with a different poet throughout the month of April. I don't think I can choose a favorite - there are so many wonderful interviews with the likes of Douglas Florian, Jane Yolen, Helen Frost and more! The poetry e-books PoetryTagTime and P*Tag are excellent collections. I especially love the way they convey that poetry is a living, vital art, one that real people are creating in response to one another's art. As the description for PoetryTagTime says, "PoetryTagTime is a chain of poets and poems that makes language part of a playful game. When a poet is tagged, that poet must write a poem that connects with the previous poem. Part of the fun is the poet’s explanation of the sometimes whimsical “connection” between the two poems." P*Tag is a collection for teens where poets create poems in response to photographs. I've seen this collection really inspire teens writing their own poetry, based on photographs or images they see in the world around them. Poet Laura Salas has created a great resource to give teachers a quick and simple poetry activity for the classroom. As she writes, "These are quick and casual and done for fun. I’ll also be posting the text of each poem each day. So you can use these posts just to find a delicious daily poem to read, or you can watch the video with your students and start writing!" I've had fun sharing these with teachers and friends. Amy is a poet and former teacher who shares many original poems on her lovely blog Poem Farm. Some poems are hers, others are by students in her workshops. 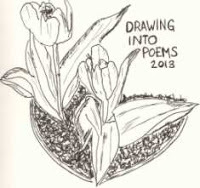 This month Amy is featuring Drawing into Poems. As she writes, "Each day of this month, I will slow myself down, look closely at something, draw it, and take notes around my drawing. I'll photograph and share the drawing and notes here each day. From time-to-time, at least on Fridays, I'll share a poem inspired by my drawings and notes." I love this notion of poetry inspiring us to slow down and notice details around us. I hope you enjoy sharing poetry with your children this month and throughout the year. If you make a purchase using the Amazon links on this site, a small portion goes to Great Kid Books (at no cost to you!). Thank you for your support. There are times a story fills you with inspiration and love so much that you just have to reach out and share it with a friend. 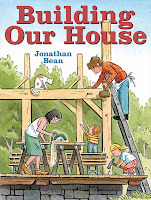 As soon as I read Building Our House, by Jonathan Bean, I knew this was exactly the perfect story for our friend Ry and his family. Recently he asked me if I knew any books to share with his sons who love building things, watching their dad work on construction sites, and plan their own building projects. This book not only shows all the steps of building a house, but it's full of love and warmth in a way you'll want to read it over and over again. A young family buys a plot of land in the country and sets about building their home from the ground up. Right from the beginning, you're brought into the oldest daughter's perspective, and you can feel this family's excitement. Children will be fascinated by each step of the building process. I just love this picture below, and how the little girl is studying the house plans right along with Mom and Dad. The whole family works together to build their house. For all the great construction details, this story is ultimately a celebration of a family’s love. The drawings radiate with warmth, as everyone works together through thick or thin. Their friends come from all over to help build the frame. But then the family works piece by piece through the seasons to finish each detail. Jonathan Bean drew on his own childhood memories to create this story. As he writes in the author's note, his own parents built their own house when he was a small child. The photographs Bean includes help bring this story to the next level - letting kids know that this really can happen, that a family can work hard towards their dreams, and that it takes everyone working together. "I like this book because I love building and I want to build a house with my dad." You just know that this is a book he's going to read over and over again with his family. Fills my heart, this does, knowing how much a book can connect with a kid and his dad. Read more about Jonathan Bean's process at the Horn Book's Five Questions for Jonathan Bean. See other reviews by Paula at PinkMe, Tasha at Waking Brain Cells, and a starred review at Kirkus. The images are copyright ©2013 Jonathan Bean, shared with permission from the publisher, Macmillan. The review copy came from our home collection. If you make a purchase using the Amazon links on this site, a small portion goes to Great Kid Books (at no cost to you!). Thank you for your support. Laughter is one of the best ways in to reading. I love sharing joke books, silly books and books with word play and puns. But you know what? These are great for developing reading skills, too. Many jokes and puns revolve around double meanings. In order to understand jokes, kids have to have sophisticated reasoning and reading skills. Most of these books are meant for kids ages 7 and older, in 2nd grade and up. They work best for kids who have already learned to read and can get the jokes. Here some of my favorite books to share on April Fools Day, or any day I want to hear kids laughing. 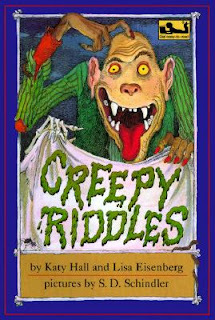 Kids still love this classic wordplay book which uses single letters and numerals to make sentences 4 U 2 decode. 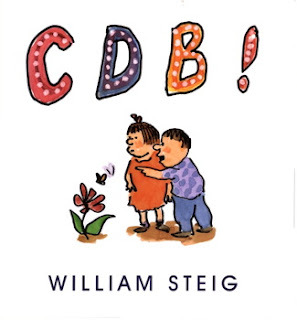 Steig's clever humor, combined with drawings that give just enough clues, is X-L-N fun. Can you figure out "I N-V U" or "D N S 5 X"? Just in case, there's an answer key in back - but no P-K-N! 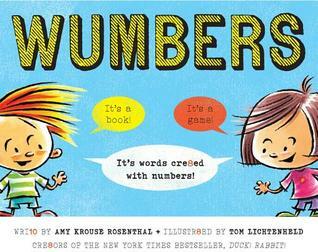 “Wri10” and “illustr8ed” by Rosenthal and Lichtenheld, Wumbers will delight kids as they figure out these words cre8ed with numbers. These word puzzles work much the same way as Steig's CDB! -- you'll find yourself saying them aloud to hear the words and figure out the puzzles. The puzzles are fun, just right for 3rd and 4th graders to figure out. If you like word puzzles, you'll love Agee's collection of palindromes - words and sentences that read the same forwards as backwards. Just try it with the title - go on, I'll wait. Now try these easier palindromes: "Star rats." "Wonton? Not now." With each, Agee pairs a simple, comical drawing that amplifies the humor perfectly. Plenty of white space gives young readers the time and ability to figure out these puzzles. Perfect for making flexible thinkers who have fun with words! 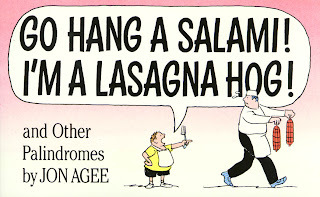 I also love, love Jon Agee's out of print Who Ordered the Jumbo Shrimp? and Other Oxymorons. Brilliantly funny, and perfect for kids (find it still at your library here). The layout and design helps young readers, with only one joke per page, written in large font. The illustrations help children think about the word play and understand the joke. Schindler’s cross-hatched illustrations might remind parents of Edward Gorey’s classic cross-hatched drawings, but they will also appeal to new readers, with just the right amount of gross details to elicit groans and laughs. Do you have any favorite joke books to share? I love finding new ways to make kids laugh and hook them with reading at the same time! The review copies came from our local library and our home collection. If you make a purchase using the Amazon links on this site, a small portion goes to Great Kid Books (at no cost to you!). Thank you for your support.